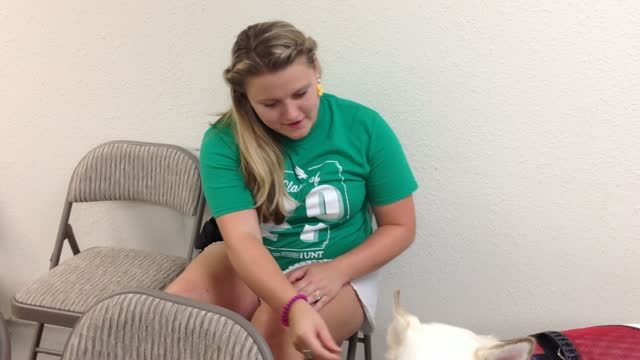 Service Dog Training, Carrollton, TX - What An Obedient Dog! A Therapy Dog is one that provides comfort to people in hospitals, nursing homes, assisted living facilities, or anywhere else a therapy dog would be needed. The dog should have a good temperament and be relatively calm, with a gentle playfulness, and a love of humankind. Dogs are so free to give their love and affection to anyone, and do not let us feel we are different from anyone else. Therapy Dogs help people forget their grief, suffering, illnesses, loneliness and age, even for a moment of time is very therapeutic. The Dog Obedience Classes required include Puppy/Beginner ($139), Middle School ($139), Canine Good Citizen (CGC) Prep ($159). Most organized Therapy Dog Groups (i.e, Therapy Dogs International or Pet Partners), do require that the potential therapy dog pass the Canine Good Citizen (CGC) Examination. Some organizations have additional testing that is required to join the group. Joining a therapy dog group is becoming very popular as it is something that you and your dog can do together! Our Service Dog Training program requires a consultation by phone to assess your dog for service work and discuss the tasks you need your dog to do for your disability. The next step is a commitment from you to work together anywhere from 6 months to 2 years (depending on your goals, your dog's age, and the tasks required for your service dog), and are involved in practicing on a daily basis with your dog during and after the Service Dog Training program. The Dog Obedience Classes required include Puppy/Beginner ($139), Middle School ($139), Canine Good Citizen (CGC) Prep ($159). After graduation, we start with Private Training sessions (starts at $135) in accordance with your dog's individual task training program for your disability and prepare for the Public Access Test. 1. An Emotional Support Animal is one that provides therapeutic benefits to its owner through companionship and affection. The owner of an Emotional Support Dog receives a sense of well-being, safety and calmness from their dog's physical presence. Emotional Support Animal are not specifically trained to perform a given task that a person with a disability may have. Instead, the dog only needs as much training as any other dog would need, in order to live peacefully among people without being of any trouble or danger to its owner or other people. We do not train psychiatric service dogs. Emotional Support Animals DO NOT have public access with its owner. They can only travel on an airplane with their owner. *Each dog enrolled in our Emotional Support Service Animal program starts with our Puppy/Beginner class. Then attends our Middle School class followed by the Canine Good Citizen (CGC) Prep class to prepare to pass the CGC Test, and further training sessions to prepare to pass the Public Access Test (PAT) (for airports and airplane travel). 2. A Service Dog is a task oriented dog specifically trained to assist their owner in mobility or to perform certain tasks that are directly related to the person's disability. We do not train psychiatric service dogs. Task Oriented Service Dogs have public access everywhere with its owner, including airplane travel. Lean in, block front, block behind, retrieve objects, stand, brace, turn on light, turn off light, pull objects, touch (nose), tap (paw), go get help, park it, open door, close door (see videos above), open drawer, close drawer, take off socks, under the table, alert for alarm, alert for doorbell, alert for phone, and many more. All tasks are performed for client's individual needs for assistance. *Each dog enrolled in our Task Oriented Service Dog program starts with our Puppy/Beginner class. Then attends our Middle School class followed by the Canine Good Citizen (CGC) Prep class to prepare to pass the CGC Test, and further training sessions to train your dog to do the tasks you need for your individual disability, as well as, prepare to pass the Public Access Test (PAT) (for public access wherever you go, including airports and airplane travel). Kronk started at Puppy/Beginner when he was 10 weeks old as a Service Dog in Training. Next he took Middle School to learn more distance with stays, duration with wait and stay, and learn to handle distractions in which he would encounter as a Service Dog. Finally, he attended the Canine Good Citizen (CGC) Prep Classes in July 2017. He passed his CGC Exam on August 19, 2017 and received his AKC Canine Good Citizen certification. He is such an energetic dog and eager to please. He loves to tug and fetch, which is a great quality in a service dog in order to open and close doors and refrigerators and retrieve items for his owner. He is now in private sessions learning his task work, and on his way to become a Task Oriented Service Dog for his owner. 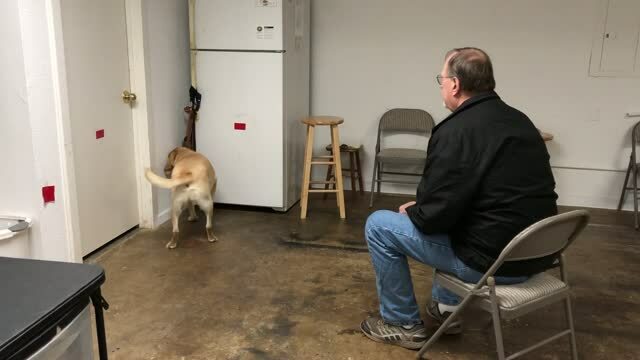 After he learns all the tasks necessary to assist his owner, he will take the Public Access Test (PAT) as the final test towards becoming an official Service Dog. Way to go Kronk!! After private service dog training sessions, Buddy attended the Canine Good Citizen (CGC) Prep Classes in March 2016 as a Service Dog in Training. He passed his CGC Exam on April 30, 2016 and received his AKC Canine Good Citizen certification. He is such an awesome dog! Buddy was then ready to take his Public Access Test (PAT). He passed his PAT on May 4, 2016 and is now an Emotional Support Animal for his owner. Awesome job Buddy! Kaiser attended the Canine Good Citizen (CGC) Prep Classes in January 2016 as a Service Dog in Training. He passed his CGC Exam on March 5, 2016 and received his AKC Canine Good Citizen certification. He is such smart dog, and is so boned to his owner! After private service dog training sessions, Kaiser was then ready to take his Public Access Test (PAT). He passed his PAT with flying colors on May 4, 2016 and is now a Task Oriented Service Dog for his owner. Great job Kaiser!